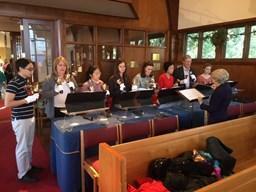 Membership in the adult choir at St. Dunstan’s is open to singers of high school age and above. The choir sings music of a wide variety of styles and genres – from traditional anthems and service music of all eras to contemporary gospel music. In addition to leading in worship at our 10:45 a.m. service, the adult choir sings for other occasional services and concerts. Instrumentalists often join us to accompany special feast day services. Prior choral experience or music reading skills are not required to join the choir. The choir rehearses on Sunday mornings, 9:45-10:35am, just before the 10:45 service. The music in our 9 a.m. family-oriented worship service is lead by our praise band. The band leads in singing fun, easy-to-sing praise songs, worshipful choruses, and contemporary versions of traditional hymns. The band warms-up a little before the service begins and rehearses occasionally; there are currently openings for any interested singers, a bassist, a drummer, and wind players. This group is open to anyone of middle school age or above. Music is an important part of our life at St. Dunstan’s Episcopal Church, and this is especially true for the children of our church. We play music games, sing songs, dance, learn about music, and have a great time! 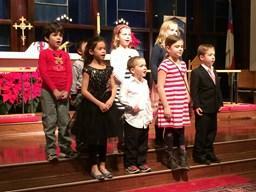 We also learn songs in preparation to sing for special events and worship services, such as our annual Christmas pageant. Various musical opportunities arise for children throughout the program year. St. Dunstan’s is blessed to have a stately 2-manual (plus pedals), 14 rank pipe organ in the rear gallery that speaks beautifully in the warm acoustics of our building. The organ was originally built by the Wicks Organ Co. (Opus 5957) and was dedicated on January 8, 1984; some of the flute stops have since been re-voiced by local organ builders at Di Gennaro-Hart Organ Co. A complete stop list can be downloaded here. © 2015 St. Dunstan's Episcopal Church | All Rights Reserved.